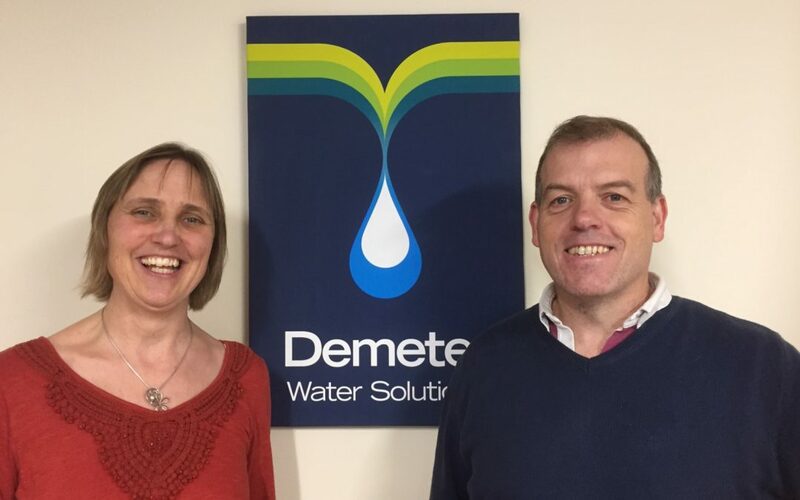 In our latest Spotlight On feature, Leanne Fawcett chats to Liz Smedley from Demeter, the water management and monitoring company, based in Sedgefield. Here, business development director Liz talks about the history of the business, which was launched in 2008, their plans for continued growth and the industry boost they’ve recently received. Tell us more about Demeter’s history. After working in the water industry for over 20 years, Demeter was set up in 2008 by my husband Andy. He was very keen to run his own business, working with private companies to monitor and reduce their water usage in a time of increasing water scarcity. Andy’s initial plans for the business were mostly around repair and leak detection but because of the increasing use of technology to collect meter data remotely, Demeter had a growing number of requests for datalogger installation. Andy felt there was a gap in the market to help businesses really understand the information regarding their water usage and ultimately benefit from it by saving money and water. He used his own knowledge and expertise to design a user friendly interface for clients to view and interpret their data readily and easily. Utilities ManagerTM is the resulting software which is now not only used by Demeter but also licensed to water retailers for use with their customers. Version 3 of the software is due for launch in the new year. Due to successful interventions of leaks and reduction of water usage, more and more customers referred our services to their business contacts either directly or through forums. From there the business grew and here we are, 10 years down the line. Tell us more about the services offered. Water can often be given less emphasis compared to gas and electricity due to their relative prices. But people can often underestimate the cost of a water leak which can go unnoticed for prolonged periods of time if they are below ground level. Additionally, internal problems such as running taps and toilets accumulate over time and cost businesses money if not reported and maintained. We offer proactive water management and monitoring services by providing, installing and maintaining water datalogging equipment to the customer’s water meter. Water use data from the logger is transmitted to the Utilities Manager software, where customers can access the data at any time. The software interprets data into volume of water consumption as well as the cost, so our clients can really understand their water consumption and the costs associated with it. We check these profiles every single day to reduce or eliminate wasted water and identify leaks and bursts quickly. This support that we offer our customers is a safety net for their water usage, as they know that we are always checking for problems and increased usage so they can concentrate on running their businesses. We are unique in our approach to monitoring, and think our methodology is the most effective way of sustaining savings. Having a sound water management system can be beneficial to customers not only for cost purposes but also billing validation. It can also be integrated into their environmental management schemes. Tell us more about Demeter’s portfolio of clients. We provide water monitoring services to a whole range of organisations such as care homes, hotels, council buildings, schools and industrial companies. We have a concentration of clients in the North East because of our location, but now also manage nationwide sites. We have a 95% retention rate in our core business of monitoring services and consistently receive very positive feedback. We have seven staff, including our own data technicians, who are based from our Sedgefield offices. We also carry out leak detection and repair work wherever the client needs us. The water market that opened in April 2017 has opened up a whole new area of business for us. In addition to our direct clients, we are now delivering all our services to water retailers for their end customers. What does the future hold for Demeter? We are actively looking to grow and have plans to expand the team at our Sedgefield offices. We have also recently been re-certified with ISO 9001 and 14001 standards – We’re over the moon about this as it has come during our biggest period of growth. This is an exciting time of opportunities for us. The new water market means a renewed focus on customer service and saving water which has been brought into focus by media attention on potential droughts after the hot summer of 2018. The experience we have built over the last 10 years to reduce customer water bills puts us at the cutting edge of how best to deliver results. You recently became members of CDEMN. What do you hope to get from that? We met Ben Gilhespy at a networking event and wanted to become part of CDEMN because many of our target market and customers are members, so it’s a good way of raising our profile and supporting our plans for growth. For more information visit checkyourwater.co.uk.